I’m still scared of going to Hell. I don’t believe I—or anybody—will be tossed into the eternal flame anymore, but the idea of the place is far too ingrained in my head from childhood for me to entirely give up the notion that I could spend my eternity roasting in a lake of fire, cut off from all that’s good and pure in the universe. Fear’s always been a good motivator, and when you’re a little kid, growing up in a fundamentalist church, there’s always the attempt to drum into your head that if you die without being saved or after having rejected God, you’ll be stuck with blinding torment for the rest of time. It’ll be dying over and over and over again, only you won’t actually die. You’ll just sizzle. The sequence is a masterpiece of just about every level of filmmaking craft, from acting to writing to cinematography. The shots of the trees blowing in the wind, the voice of Tony’s young daughter (echoing Meadow’s words back in “reality”) rising above them, were a motif the show would return to again and again, and it’s easy to see why. There’s a spooky grandeur at work here. Trees often symbolize the eternal because they’re the closest things we have in our own lives to something that is eternal, and I like that this episode posits that one portal—the door to the Inn—leads to whatever’s beyond this life, while the other portal—heading into that gap in the trees—will lead back to this plane. The trees act as a bridge or conduit, between us and the heavens, between us and the time they were planted, between us and everything that is to come. We, ourselves, are doomed to die. So are the trees, but they’re going to make a much better stab at living forever than we ever will. Tony’s saved by his hesitation, by hearing the voice of his young daughter and not yet being ready to leave echoing over that ocean of eternity. And then the light takes him. If we’re looking at real-world structures that fulfill basically the same function as Purgatory, a hospital’s not a bad place to start. It’s a building filled with people stuck between life and death, yes, but it’s also a place where the loved ones of those people wait for more news, trapped in their own kind of stasis. “Mayham” expertly shows how the long uncertainty about Tony is weighing down his family and friends. Carmela’s starting to seem a little manic, while the guys on Tony’s crew are ready to get back to work, spending less and less time at the hospital and more and more time out there making money. Vito even takes a meeting with Phil to grouse about how Silvio is more interested in making sure Carmela is cared for than the “earners.” Everybody’s waiting to see what will happen, and they’re all readying their next moves in case Tony—God forbid—takes a turn for the worse. Even Silvio’s wife is making sure he’s ready for that next step. The underlying tone here is one of broad comedy. That’s probably to be expected when the primary mob story in the hour is one featuring Paulie and Vito, particularly one that has Paulie injuring his balls. (Hearing Tony Sirico say, “My balls!” may make up for the hour’s other deficiencies, honestly.) After an episode that was quiet and contemplative, it’s also a fairly strange choice, I think, though it’s not like it doesn’t work. It’s just jarring to go from, say, Carmela talking with Melfi about how she worries she’s made her children “complicit” in the mob life Tony belongs to or Tony-as-Finnerty having a talk with the monks about how when we die, we’ll be just like those trees over there, to Paulie and Vito squabbling about getting Carmela her cut of their haul from taking out a couple of drug dealers. The two tones—broad comedy and contemplative drama—have always existed concurrently in the show. You don’t have to look much further than, say, “Pine Barrens” to be reminded of that. 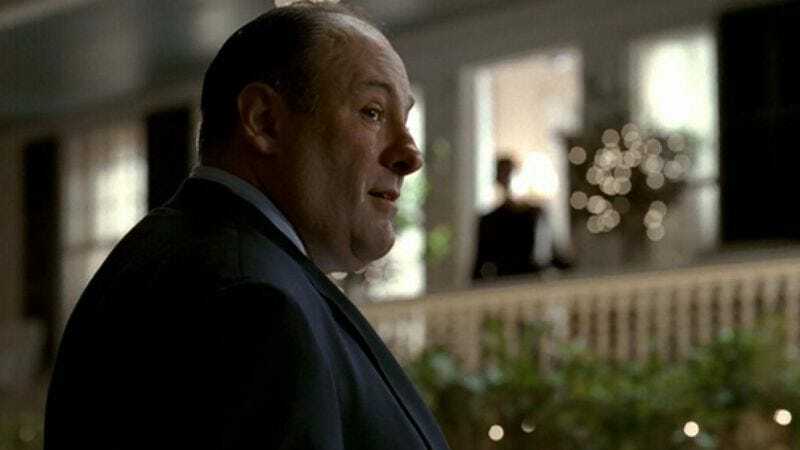 Yet in this episode, the stakes on Tony’s end are so much higher than the stakes on Paulie and Vito’s end that the juxtaposition is more jarring than it normally would be. But maybe that’s the point. When someone you love is potentially dying, it’s all you can think about. But eventually, life has to reassert itself. You need to get back to work at some point, and the more distant you are from the person in that hospital bed, the sooner that point comes. If the person lying in that bed is your spouse or child or parent, you’ll be there morning and night. But if it’s your boss—no matter how much you like him—you’ll eventually find a way to get back to your day-to-day life. Carmela’s frazzled by the simple act of buying coffee, and A.J. just about loses it when Carmela simply asks him if he remembered to bring her a sweater. But the other guys are starting to drift away from what’s happening, starting to think about what comes next. Their lives will go on, no matter what happens to Tony, and they’re going to have to figure out how to deal with that. They loved and respected Tony, but that won’t matter much if the man dies. I like the way the episode eases up to this idea. To us, Tony’s safety is of utmost importance because he’s the show, in a way that’s different from many other dramas of this sort. Tony’s point-of-view has always been our point-of-view, for the most part, and while we like the other characters, we don’t have nearly the attachment to them that we have to him. But to the other characters, if Tony dies, it’s going to be painful and hard, but it’s not going to mean their end of involvement in the mob, like it probably would for us. So things lurch forward again. One of my favorite scenes in the episode involves the mobsters gathering to hear J.T. Dolan’s pitch for a mob movie named Cleaver—it’s Saw meets The Godfather!—which is clearly just a way for Christopher to work out many of his issues with Tony. Would something like this have happened while Tony was still conscious? Would Christopher have even suggested it? To live your life, you need to mostly ignore that death could be around any corner. The more we think about how it could all end, the less effective we are at doing the things that need to be done. Yeah, the thought of death arriving might make you wear your seatbelt or eat better food or exercise, but it’s fairly likely that you don’t spend your entire life in a catatonic terror about how you, too, will someday end up at the Inn At The Oaks. That point is raised somewhat obliquely by the Ojibwe proverb Christopher finds on Tony’s hospital room bulletin board after the big guy wakes up (and is mostly forced to sit there and listen to everyone talk to him): “Sometimes, I go about in pity for myself, and all the while, a great wind carries me across the sky.” It’s one of those bits where it’s not immediately clear just what the show is trying to say. My colleague Matt Zoller Seitz interpreted it, in some ways, as a fancier way of saying that old Livia lament, “Poor you,” and there’s also a message there about one of the show’s greatest themes—how hard it is to change your behavior. But I also think it’s all about how we never really perceive the way that we’re caught up in forces beyond ourselves, the way that we act as if we’re the only people to ever have suffered when the architecture of the universe is built on suffering. Put another way: Tony Soprano goes to see those monks while he’s in Purgatory (or his coma-dream, if you will), and the monks laugh at his insistence that he’s not Kevin Finnerty. What does it matter, they ask. Someday, he’ll die, and he won’t be any different from a tree or a cat or any other man, even Kevin Finnerty. But even in life that’s true. We’re all caught up in currents we don’t understand, and the more we try to struggle against them, the more we find ourselves swept downstream, carried away by something we don’t dare acknowledge or even think about. We’re all being carried inexorably toward our own deaths, and when you start to think about that, then the petty concerns fall away. We think we’re all different, but when it boils down to it, we’re just new masks on the same old soul. I can’t praise that Carmela therapy scene enough. I think Edie Falco is always at her best when she’s edging up to admitting just what she’s been complicit in all these years, before backing away almost immediately. She’s riveting when she wonders just how much her children know. This is one of the few episode titles where I couldn’t immediately remember where it came from. It’s a mispronunciation of “mayhem” (of course) by Paulie (of course). Furthering the hospital-as-Purgatory angle: Don’t you sort of think Sheryl Crow’s cover of “The First Cut Is The Deepest” would play constantly in Purgatory? The look on James Gandolfini’s face when he’s emerged from his coma is just great. Here’s a man who’s not dead but might as well be. A gag I’ve always loved: Paulie all but talks Tony to death. When coma-Tony pounds on his hotel room wall to get the voice next door to keep it down, it makes it even funnier. I always like having J.T. Dolan drop by, and his look of obvious irritation when Little Carmine breaks in about the “films” he’s produced is great. Always nice to see A&E’s Bill Kurtis pop up on a show like this to give the fictional proceedings a feel of real-world weight. I’ve been told I should point out more Godfather references in these, so if I can remember to do it, I will. Here’s one: A.J. says it’s “difficult, not impossible” to get to Junior in lock-up, which is a Godfather II quote. Another not-so-subtle reminder that Vito is gay comes when he comes upon Finn in the hallway at the hospital and we’re reminded of how Finn caught him last season. This, of course, will be the center piece of much of the season to come. Okay, after giving Master Of Sopranos some guff last week, I’ll admit that I didn’t notice the connection between the mural in Holsteen’s and the Inn At The Oaks at all. Even if you don’t think Tony dies, that little tidbit gives that final scene even more of a sense of impending doom on a subconscious level. A.J.’s attempts to kill Junior will return, though he’s never going to get the job done. Like anyone would have thought he might!